Three years ago, many of us were glued to the “spill cam” showing, in real time, the gushing oil from the April 20, 2010 explosion sinking the Deepwater Horizon oil rig in the Gulf of Mexico, killing 11, and spewing oil until July 15. 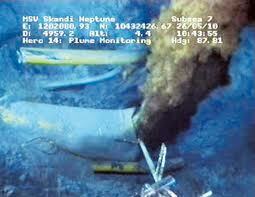 Trials have been taking place this month, as people try to meet the 3 year deadline to sue BP and others. But what happened to the 200 million gallons of oil? (Is anyone up to date on this?) Has it vanished or just sunk to the bottom of the sea by dispersants which may have caused hidden destruction of sea life? I don’t know, but given it’s Saturday night around the 3 year anniversary, let’s listen into a reblog of a spill-related variation on the second of two original “overheard at the comedy hour” jokes. Even if we grant (for the sake of the joke) that overall, this “test” rarely errs in the report it outputs (pass or fail), that is irrelevant to appraising the inference from the data on April 20, 2010 (which would have differed had the more stringent test been run). That interpretation violates the severity criterion: the observed passing result was altogether common if generated from a source where the pressure level was unacceptably high, Therefore it misinterprets the actual data. The question is why anyone would saddle the frequentist with such shenanigans on averages? … Lest anyone think I am inventing a criticism, here is a familiar statistical instantiation, where the choice for each experiment is given to be .5 (Cox 1958). A single observation X is to be made on a normally distributed random variable with unknown mean m, but the measurement instrument is chosen by a coin flip: with heads we use instrument E’ with a known small variance, say 10-4, while with tails, we use E”, with a known large variance, say 104. The full data indicates whether E’ or E” was performed, and the particular value observed, which we can write as x’ and x”, respectively. (This example comes up in, ton o’bricks). In applying our test T+ (see November 2011 blog post ) to a null hypothesis, say, µ = 0, the “same” value of X would correspond to a much smaller p-value were it to have come from E’ than if it had come from E”. Denote the two p-values as p’ and p”, respectively. However, or so the criticism proceeds, the error statistician would report the average p-value: .5(p’ + p”). You can search the blog for connections between this event, the June 2010 conference at the LSE (especially the RMM volume), my introduction to deepwater drilling, and the blog’s “mascot” stock, Diamond offshore, DO, which, incidentally, just had earnings. There have been around 4-5 others since then, not sure. Terms I learned from the 2010 oil spill: blind shear ram, blowout preventer, top kill, junk shot, junk kill, top cap, cement bond log, kill weight, bullheading, corexit, containment booms, mud pump, remote operated vehicles (ROVs), static kill, bottom kill, relief well, annular preventers, vessels of opportunity, elastomeric packing unit.